Give a gift that's perfect for so many occasions, a gift certificate for an Origional Custom Henna Tattoo. Your GIFT CERTIFICATE recipient will be treated to a little pampering. At their personal appointment they can be as simple or as lavish as they wish getting just what they want in a private, comfortable setting. 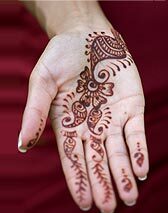 A Henna Tattoo is an original gift to give the members of your bridal or birthday party. 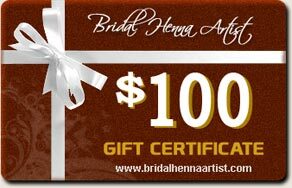 GIFT CERTIFICATES from Bridal Henna Artist are available in any dollar amount. Your bridesmaids and groomsmen can make a personal appointment for some self-indulgence.